Designed in collaboration with Italia Independent founder and yacht owner Lapo Elkann, whose love of the ocean was instilled in him by his grandfather Gianni Agnelli, the Big Bang Unico Teak pays tribute to the nautical world with a King Gold case embedded with a teak bezel. The watch is equipped with two straps, an orange rubber version and a Kevlar carbon and rubber strap cut from a yacht sail, which can be easily interchanged. 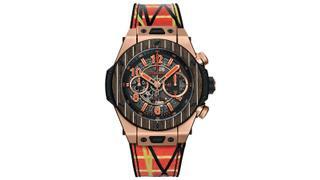 Each limited edition watch will also come with a pair of Italia Independent sunglasses with frames also crafted in teak. 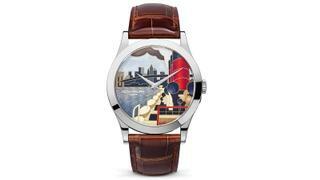 One of three limited edition timepieces dedicated to the famous passenger ships which crossed the Atlantic before the advent of air travel, this Patek Philippe Calatrava watch features a hand-guilloched dial with cloisonné enamel to depict the arrival of the ocean liners in to Manhattan. Each handcrafted dial features 78cm of gold wire, 20 different enamel colours and required ten firings in temperatures up to 800 degrees Celsius to achieve the vivid effect. 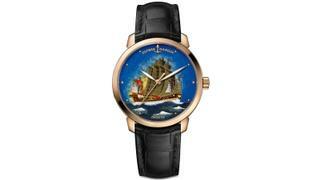 Created in tribute to Chinese maritime history, the newest addition to Ulysse Nardin's Classico collection depicts the Zheng He Treasure Boat in traditional enamel cloisonné. The Treasure Boat (or Bao-Chuan) was an enormous 137 metre long ship belonging to the fleet of admiral Zheng He, an early-15th century explorer or mariner who led a number of pioneering voyages throughout Southeast Asia, Africa and Arabia. With a 55 metre beam, the ships offered space for 500 crew, nine masts and four decks, as well as the precious cargo Zheng He brought back from his voyages. 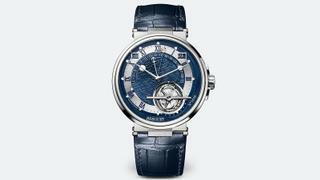 If you’re after something with a more subtle marine influence Breguet’s aptly named collection has much to offer. The 5887 is a particularly fine example and boasts a fashionable blue dial engraved with a delicate wave pattern while the second hand is finished with an anchor pointer. Housed in a 950 platinum case complications include a perpetual calendar, leap-year cycle, power reserve aperture and tourbillon. 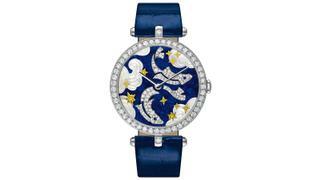 Hailing from the Poetic Astronomy range of Van Cleef & Arpels Extraordinary Dials collection, the Lady Arpels Zodiac Pisces timepiece pays homage to the most aquatic of the twelve zodiac signs. Two diamond fish are surrounded by mother-of-pearl waves and yellow gold and diamond stars on an engraved white gold and enamel dial that is, in turn, framed by white diamonds. 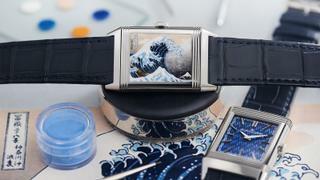 For its latest range of Métiers d'Art timepieces, Jaeger-LeCoultre took inspiration from some of the world's most famous paintings, including Katsushika Hokusai's The Great Wave Off Kanagawa. The ocean-themed masterpiece has been delicately guillochéd to the dial before being carefully enamelled to achieve the deep blue of the waves and expressive colours of the original artwork. 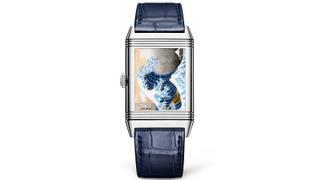 Framed by the Art Deco-style case of the Reverso, the timepiece is a must-have for art lovers and a brilliant showcase of Jaeger-LeCoultre's craftsmanship. 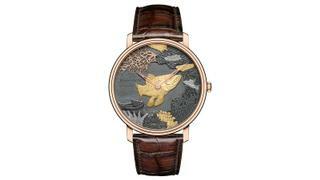 Unveiled in 2015 as part of Blancpain’s on-going commitment to and mastery of Japanese Shakudo engraving, this unique timepiece depicting the critically endangered coelacanth fish also highlights the brand’s environmental contributions through its Ocean Commitment programme. Crafted in a wide 45mm case, the incredibly detailed engraving is allowed to shine through with little in the way of distractions from date window, tourbillons or other dial ephemera.